Management / Patterson Research Inc.
Every project needs to be managed. On small projects one person may be the architect, the project manager, the designer and the builder. On larger projects each of these roles will have several people assigned. Regardless of the size, keeping a project focused requires good management. There is a tendancy to make a project manager the first resource on a project. That can work. But as general principle it is best to assign an architect first. One project manager from my past, one that I have considerable respect for, understood the distinction between the roles of project manager and architect. Inherently they have different interests. The architect wants to see requirements met. The project manager wants to get the job done. Especially on larger projects, these roles need to be independent of each other. Some people see project management as an administrative role. They'll advertise for someone who can work with MS-Project, operate a ticketing system, prepare a plan, estimate and record tasks and resources, etc. These skills are important and a necessary part of project management. In my opinion, however, the real management happens around the project. Do we have the right people assigned to each task? Does the owner have sufficient business resources assigned to clarify requirements and perform testing? How do we manage the summer months when vacations interfere with schedules? Are there external influences that could derail the project? Have we thought through the tools and facilities we need and will they be ready when we need them? A good project manager will anticipate and avoid pitfalls on many fronts. The Project Management Institute has contributed significantly to project management as a profession. While I've never pursued a PMP designation, I respect what they teach for structuring and managing projects. To this point in my career, however, when I'm assigned as a project manager it's because someone wants a job done. In the end the project manager is the glue that holds everything together. While I recommend hiring an architect first, a project manager should be the second person assigned to a project. Every web designer needs a toolkit. From text editors to graphics programs, from table structures to fluid style sheets, the web designer has many tools and techniques to choose from. 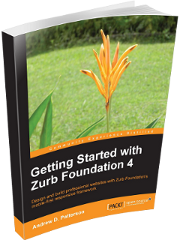 Zurb's Foundation framework is an excellent kit for today's web designer. It's fluid, it's easy to work with, it has plenty of components, and most importantly, you can apply your creativity to make designs your own. This book documents Foundation's grid system, all its components and plugins, and its generation of custom style sheets. It starts with the basics of Foundation and helps you build your skills as you advance from installation to design, configuration, and customization with examples at every step. This book will be of great benefit to web architects, designers, and builders. While it helps to be a programmer, it isn't necessary.